One of the Amish cookbooks I most love, is The Amish Family Cookbook by Jerry and Tina Eicher. It's filled with so many amazing, delicious, filling recipes and the cutest little stories, side notes about Amish life. I read this cookbook front to back, every page, every blurb, every word, it just fascinates me so very much. 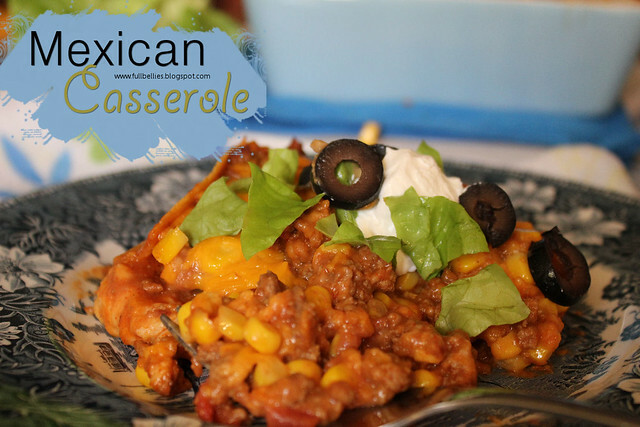 The recipe for the Mexican Casserole is actually the first in the Main Dishes category and one of the reasons I love this meal is because it's simple, but very tasty and more than enough for our family of four, with leftovers for next day's lunch. Cook beef until no longer pink; drain. Stir in taco seasoning and water. Bring to a boil. Reduce heat and simmer, uncovered, for 5 minutes. 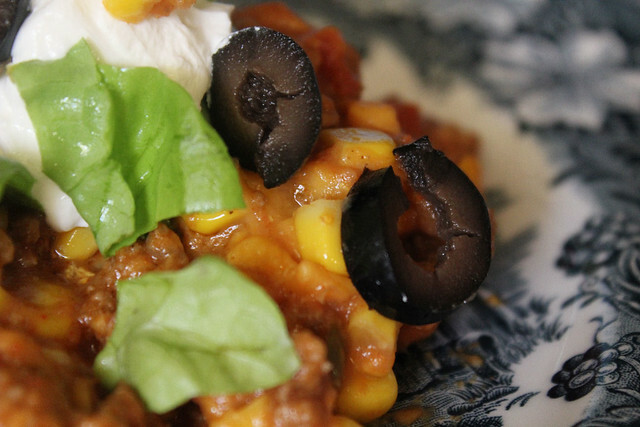 Meanwhile, in a microwave-safe bowl, combine beans and salsa. 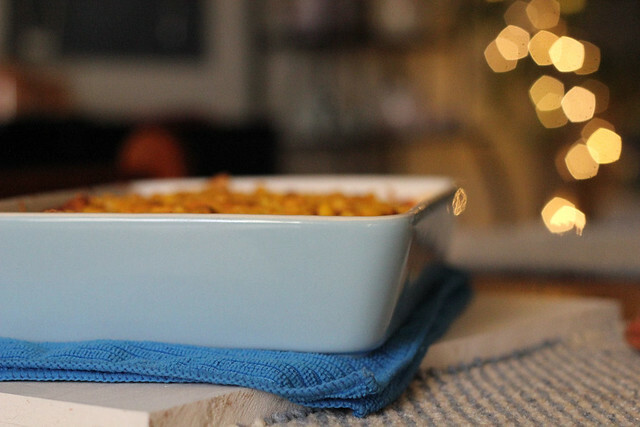 Cover and microwave for 1 or 2 minutes until spreadable. 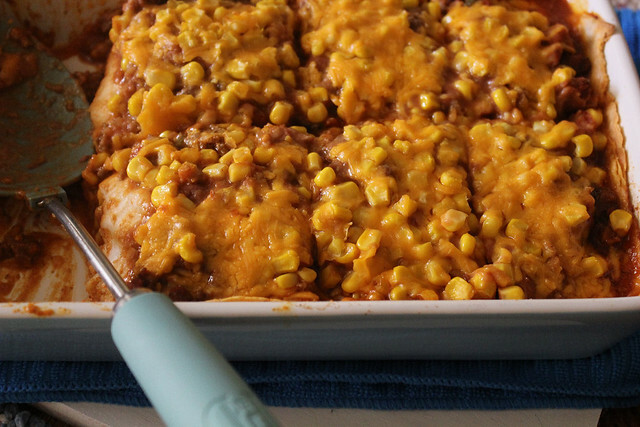 Place 3 tortillas in a greased round casserole dish. 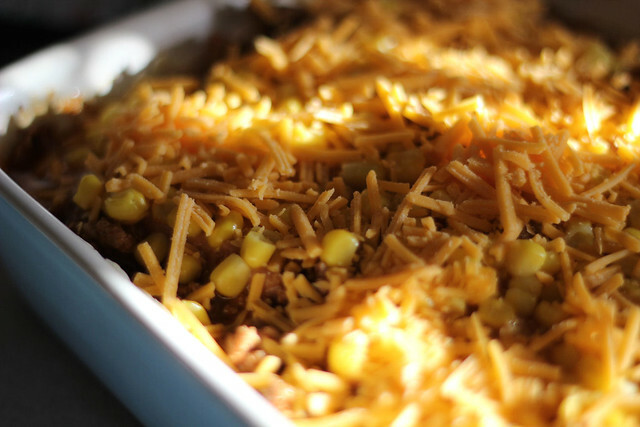 Layer with half of the beef, bean mixture, corn, and cheese; repeat layers. Bake uncovered, at 350 degrees for 40 to 45 minutes or until cheese is melted. Let stand for 5 minutes. Serve with lettuce, sliced olives and sour cream.